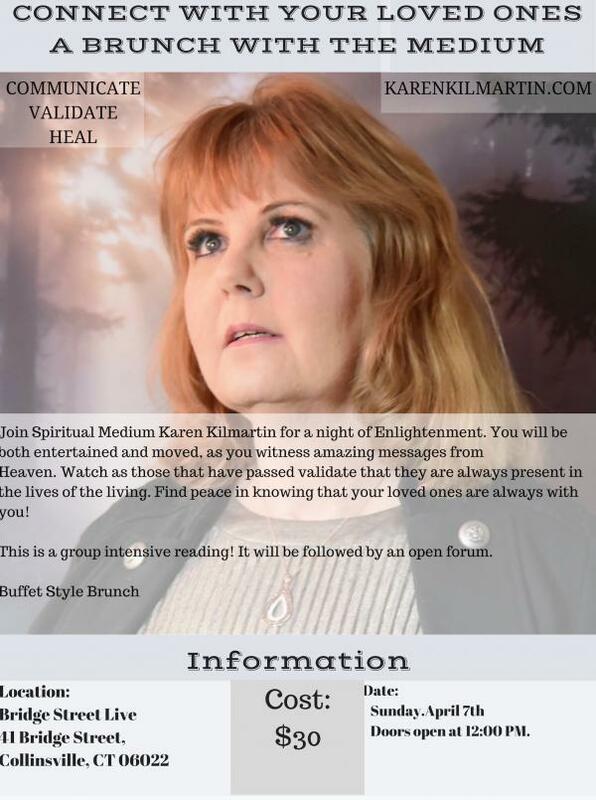 41 Bridge Street is excited to welcome Spiritual Medium, Karen Kilmartin to our stage on Sunday, April 7th at 1:00 PM. Karen Kilmartin is a spiritual psychic medium, best known for her down to earth attitude and compassion. Karen has over 50 years of experience. She is Clairvoyant, Clairaudient, Clairsentient. All of Karen’s messages are based on validation from Heaven. Whether you are in need of messages from loved ones in heaven, or you want information about your present and future, Karen’s accuracy rate is uncanny. Karen is a radio and television personality. She is a Connecticut native that is internationally known for her gifts. She has numerous clients throughout Asia and Europe. Karen is a humanitarian that believes that her gifts should be used for the greater good and has been featured by numerous organizations throughout the Northeast. She is currently in the process of writing a memoir of teachings from spirit. Doors will open at noon and brunch will be served from 12PM - 1PM. Tickets to see Karen Kilmartin will be $30 for General Admission (plus fees).